Background: The waterlogging and sediments condition in coastal area of mangroves effect a significant (α = 0.05) adaptation strategy in mangrove roots characterization. Objective: The aim of the study was to know the structure of the submerged root morphology of the Rhizophora apiculata seedlings especially to incorporate into the flooding and sediment thickness. Materials and Methods: The field data from 40 sample trees in Wonorejo Mangrove Conservation of Surabaya (07°18'32.7 "S and 112°48'59.1" U) were measured. The total number of primary roots, the root length and the root-spread distance, the root diameter, the vertical root angle from trunk and the architecture of roots were measured. Observational method was used and measurement of environmental factors consists of parameters air temperature, groundwater salinity and the acidity level of sediment. The quantitative data were analyzed by statistical test. Data of root length and number of branches were analyzed by two way analysis of variance (ANOVA) by factorial test. Results: The results of this study indicated that an adaption of the treatment condition waterlogging seemed apparent in the presence of root hairs at the base of the stem. Rooting of this species had also very different architecture, where the soil conditions were not inundated direction of root growth seemed to lead down (perpendicular). While on land conditions with waterlogging indicated the direction of growth more broad or sideways. The change of color is more brown or reddish brown on the morphology of the roots with the treatment of extreme thickness indicated adaptation to environmental stress. Conclusion: It is concluded that stress inundation and sediment thickness affects the morphology of the roots. In waterlogged soil conditions, root growth leads down (perpendicular). While on land that is not waterlogged conditions, root growth more broad direction or sideways. Sitta Amaliyah, Sucipto Hariyanto and Hery Purnobasuki, 2017. 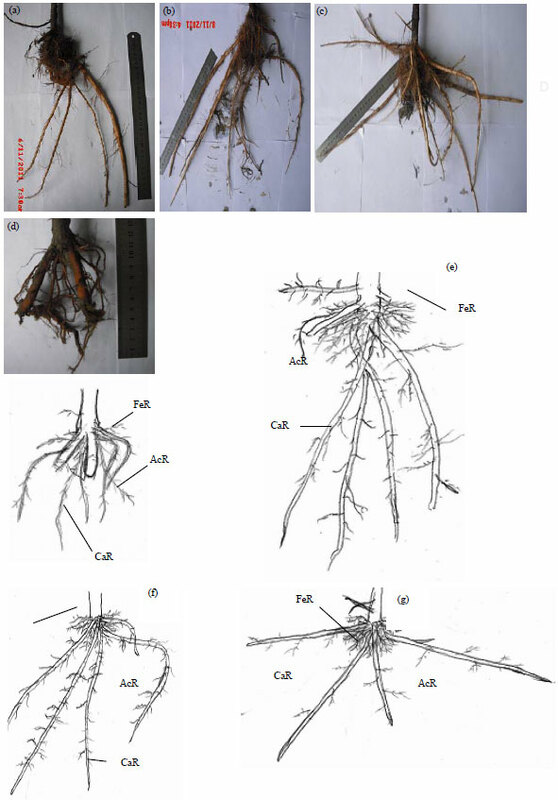 Roots Morphology of Rhizophora apiculata Blume as an Adaptation Strategy of Waterlogging and Sediment. Journal of Biological Sciences, 17: 118-126. The coastal area is a region of the border between land and sea, so called ekoton region inhabited by organisms originating from the two communities. As one of the coastal ecosystem, mangrove has a major role to human life1. Basic properties of mangrove ecosystems, namely: A high level of siltation, low oxygen levels, salinity (salt content) is high and the influence of the tide cycle. So that the ecosystem is very extreme at the same time very dynamic and is among the most rapidly changing, especially in the outer part. Only a few types of plants that can survive in the mangrove area and these types are mostly typical of mangroves having already gone through the process of adaptation and evolution of the old. The root system of mangrove vegetation is able to withstand and precipitate sludge2,3 as well as filter contaminated material4,5. Environment have badly affected the physico-chemical soil, especially soil redox potential, pH and availability of O2 in the soil6, the accumulation of CO2, induces the anaerobic decomposition of organic matter and reduce iron and manganese7. Puddle negative had effect on the growth and survival ability of the root system as well as the balance of the growth of roots and shoots1. Impact inundation including lowering the exchange of gases between soil and air which resulted in a decreased availability of O2 to the roots, decreased O2 accelerated by the presence of plants in soil, plant roots absorb for respiration8. In morphoanatomy, waterlogging increase in the number and proportion of aerenchyma vascular cylinder9. The amount of damage to crops as a result of inundation depends on the phase of plant growth. The intensity and the water level in the estuary is affected tide10. Mangrove has a distinctive morphological characteristics due to extreme environmental conditions11. This causes the roots of mangrove plants have distinctive to withstand the waves at once gripping unstable substrate. Sedimentation is the part that happens dynamically in nature12. The suspension of sediment entering coastal carried by streams, piling mud and suspended material back into the waves13. The suspension of sediment in mangrove areas are formed in the process of transport of the material during the tides. Mangrove vegetation is able to live under conditions of stagnant substrate with the height of the water column between 25-48 cm for 1 to 12 h, the water flow rate of 0-9 cm sec1 and the concentration of particles suspended in the water column between 0.009-0.15 g L2. The flow of sea water entering sediment particles that will eventually be caught in between the mangrove roots. The accumulation of sediment that occurs continuously will increase sediment thickness14. Pneumatophore is part of the roots of Avicennia involved in aerial crop. However, sediment cover the root cause damage, of which inhibits the action of lenticels that play a role in the next aeration capable of causing the death of plants15. Mangrove ability to bind different sediment. Mangrove species such as Rhizophora, Avicennia and Sonneratia had roots that is mostly superficial but effective gripping mud. The roots of these in turn dampen the onslaught of waves and trap more sediment and litter of the sea between jalinannya intricate. Rhizophora apiculata is one of the dominant plant species in the mangrove areas Wonorejo and widely used in mangrove rehabilitation program. Rhizophora apiculata had scattered the length of time shorter than R. mucronata, R. apiculata then have a better survival rate16. Rhizophora zone is able to bind 20% of the sediment. The amount of ability Rhizophora made possible by the shape of the root of the compact, the roots of Rhizophora stuck to the bottom2, in which the presence of root tissue useful double, namely supporting the establishment of the tree and as contained breathing apparatus (pneumatophore), to get more oxygen a lot of air. Some studies reveal that the water level and sediment thickness pertumbuhan tanaman cause stunted and cause death in extreme levels12,10,17. But adaptation strategies relating to growth and root morphology influences caused flooding and sediment thickness of Rhizophora has not been widely studied. This study aimed to determine the morphology of the roots of seedlings Rhizophora apiculata against inundation and sediment thickness. So this research is expected to enrich the information on the form and adaptation strategies Rhizophora apiculata mainly against inundation and sediment. Description of the study area: This study was conducted in two places, at the Laboratory of Ecology, Department of Biology, Faculty of Science and Technology, Airlangga University and Wonorejo Mangrove Conservation, Rungkut, Surabaya (07°1832.7 "S and 112°4859.1" U). The length of time required for the conduct of research for 5 months. The materials used in this research are Rhizophora apiculata seedling age of 3-4 months with an average height of 46±2 cm with the number of leaves 3-4 strands obtained from the Department of Agriculture nursery around the mangrove forest environment Wonorejo obtained from the Office Agriculture Surabaya. The necessary tools in this study include: GPS, thermometer, hand Saline-refractometer, pH meter, tweezers, meters/ruler, sieve-rise, oven, zinc gutters with a circumference of 60 cm each with a height of 10 cm gutters; 12, 14 and 18 cm. Experimental treatments: Measurement of environmental factors consists of parameters air temperature was measured by using a mercury thermometer that has a level of accuracy of up to 1°C. Groundwater salinity was measured using a hand-refractometer salino. The acidity level of sediment was measured by using a soil pH meter. Type or size of the sediment is taken as ±100 g of the base substrate to be analyzed by particle size sieve method granulometri with terraced 2:00, 1:00, 0:50, 0:25, 0.125 and 0.063 mm. Analysis of the soil, the soil used in the study and treatment before planting is carried out the analysis macro element content of soil nutrients. The selection of seeds Rhizophora apiculata, before planting, first made the selection of seeds Rhizophora apiculata. Seeds used in the study are that the seeds with good morphological characteristics, among others: The leaves are green, shiny and fresh and the trunk looked wrinkled. Experiments performed with 5 replicates in each treatment, so that the number of plants used a total of 40 plants. The study begins with plants recover for 3 weeks before the plant sample was placed at 4 different sediments (0, 2, 4 and 8 cm) in which the determination of sediment samples randomly selected plants. Experiments carried out by using a sediment barrier of zinc with different heights, surround individual seedlings. Recover the plant is done by planting seedlings to 10 cm into. Furthermore, after three weeks, except the control treatment plants, the remaining sediment is added according to treatment which is 2, 4 and 8 cm. While on treatment puddle includes land not flooded (both high tide and low tide the water does not stagnate on the surface) and stagnant (range 5-12 cm flow influenced the tides of the sea). After Rhizophora planted seedlings, watering taste, so that plants do not wilt and root is always fulfilled availability of water so it can grow to the maximum. In addition, doing weeding in an attempt to clear the weeds from the planting area for plants that grow unrivaled in getting nutrients and water. Furthermore, checks must be performed every 2 weeks for 5 months. Morphological and structural studies: Data collection was performed twice, i.e., before being planted in the media treatment and at the end of the study at month 6 by taking three primary roots in each plant. The roots were selected covering all sides of the rod is oriented parallel to the edge of the forest or on the right side, the second parallel of the first root election but on the left side of the trunk and the third is oriented perpendicular from the edge of the woods or on the front side of the stem. The way of taking root is done by digging the ground to make the diameter of a circle around the plant ±30 cm. Quantitative data from the root morphology of samples taken from the plant by calculating the average length of the primary root. While the qualitative data obtained by observing the color which is classified in white, off-white or red-brown. While the circumstances of the texture of the root surface assessed whether or not slippery; easily broken or not; there are root hairs or not. Observations made with the root architecture. Data collection include: the nature of the observed growth in the direction of growth that will be classified in type monopodial. The branching pattern of lateral axis classified type or type monoaxial. Statistical analysis: The data obtained in this study is both qualitative and quantitative. Qualitative data were analyzed by descriptive method while quantitative data by statistical test. Data of root length and number of branches were analyzed by these tests. Two way Analysis of variance (ANOVA) was used by factorial test. If from the Anova test detected no effect on treatment, then followed by the Tukey test using α = 0.05, significant difference when p <α18. Variety analysis (analysis of variants) of factorial conducted to examine the effect of treatment of sediment thickness and waterlogging on the growth and morphology on seedling roots Rhizophora apiculata, whether influential or not. While the test after analysis of variance is necessary to know what there is the mean difference between treatments root morphology of inundation and sediment thickness 0, 2, 4 and 8 cm, i.e., by the Tukey test. Physical and chemical parameters of the environment among the sites between the ground flooded with stagnant land not seem there was no difference, this is due to the location of the land is not flooded with stagnant, is less than 5 m. Environment condition was looked normally with variables 28°C ambient temperature, salinity range of 20  and soil pH 6.2. While measurement variables indicate that the substrate of R. apiculata consist of clay soil types (55.89%), then followed the with sand types (36.9%), silt (34.52%) and gravel last (5.9%). Roots length of Rhizophora apiculata: Waterlogged soil conditions affect significantly (α = 0.05) plant growth R. apiculata. The growth of roots in waterlogged soil conditions that are significantly (α = 0.05) shorter (Fig. 1).The thickness of the sedimentary response significantly depending on the growth of the root length. The growth of roots in the treatment of sediment thickness 2 cm lower than the other treatments. In control treatment, the sediment thickness have no significant difference. But at the root length of 8 cm thick the sediment differ significantly (α = 0.05) longer than the other treatments (Fig. 2). 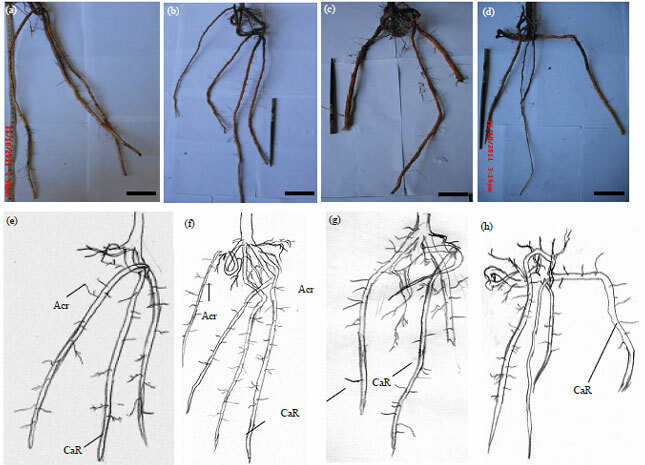 Morphology of roots: Aerial root development at the seedling R. apiculata yet apparent (Fig. 3, 4). Sediment thickness treatment effect on root morphology of which the color and state of the surface. in terms of color, the control treatment with sediment thickness of 2 cm, on land flooded and not flooded, brownish white. While on treatment thickness of 8 cm, brownish-red color in all the land conditions. Different things happen in the treatment with sediment thickness of 4 cm (Table 1). Where the root surface waterlogged conditions brownish white but on the condition of land is not waterlogged surface color indicates brownish red. The change of color is more brown or reddish brown on the morphology of the roots with the treatment of an adaptation to extreme environmental stress. Adaptation of treatment waterlogged conditions was evident in the presence of feeding root at the base of the stem. Under conditions not flooded rare root hairs (Fig. 3). While in waterlogged soil conditions, dense root hair huddled at the base of the root (Fig. 4). The state of the root surface, the soil conditions are not stagnant relatively rigid compared to the situation on the root surface waterlogged conditions. Treatment morphologically sediment thickness affects the roots of which the color and state of the surface (Fig. 3, 4). Judging from the color, the control treatment and sediment thickness 2 cm, good condition waterlogged land or land not stagnant, brownish white. While on treatment of 8 cm, in all soil conditions showed brownish red color. Different things happen in the treatment with sediment thickness 4 cm. Where the land was inundated by the condition of the surface color is still showing a brownish-white color but on the condition of land is not waterlogged surface color shows brownish red color19. The change of color is more brown or reddish brown on the morphology of the roots with extreme treatment showed adaptation to environmental stress. The number of branches of the rooting Rhizophora apiculata on the condition of land were flooded more than Rhizophora apiculata that grow in an environment not flooded, the comparison is evident in Fig. 3 (not waterlogged soil conditions) and Fig. 4 (waterlogged soil conditions). This indicates factors waterlogged soil conditions play a role in the growth of branching roots. Architecture rooting seemed different. 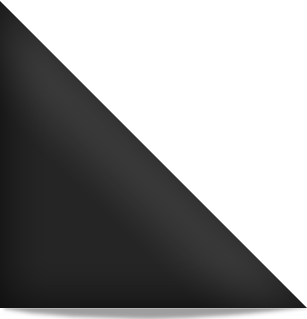 Where the soil conditions are not inundated direction lateral root growth appears pointing downwards at an angle of 45 degrees (ortotrof) (Fig. 5a). While in the waterlogged conditions direction of growth is more broad or sideways (plagiotrof) (Fig. 5b). The major findings of this study showed that the inundation and sediment thickness had significantly effect (α = 0.05) to root length growth of Rhizophora apiculata. The stress condition of mangrove habitats such as inundation and sediment thickness affects the morphology and architectures of the roots as well. It indicated that the environmental conditions favor the growth of R. apiculata especially the length of roots. Architecture rooting seemed different as well based on environmental condition. The number of branches of the rooting on the condition of land were flooded more than in an environment not flooded. It indicated that anaerobic condition push the plant to provide more organ that can supply the oxygen and supporting growth of this plant. Rhizophora adapt well in a n environment with a low pH value, type of soil and salinity brackish mud19. In general, the growth of Rhizophora apiculata between the condition of land was inundated with land that is not experiencing inundation showed no significant influence (α = 0.05). This suggests a pool of factors have an impact on the survival of plants9. Land inundation inhibit the formation and growth of roots7. Waterlogged land conditions will push the low availability of oxygen (hypoxia), research data showed the average length of the roots in waterlogged soil conditions are much shorter than on land not flooded conditions (Fig. 1). When water and nutrient needs dibutuhkan provided by land, then the roots will develop a mechanism to save the root surface area for the absorption of oxygen, water and O2 content left in the ground faster when there are plants20. Aerial systems owned R. apiculata support to adapt well21 so that the mechanism of photosynthesis and respiration can run optimally. This structure is commonly associated with the aerenchyma that allows entry of O2 and diffusion to the roots submerged8. By providing contact with air plants when environmental conditions are waterlogged, the roots are able to facilitate the absorption of O2 and translocated to the roots submerged, allowing it to maintain the growth of shoots during the period of inundation. The impact is most often described of fine sediment causing plant mortality due to sediment15. However, little research has explained the negative influence of sediment on plant growth22. Crowe and Hay23 described the sedimentation caused a reduction in photosynthetic activity affecting the primary productivity, due to the reduced light penetration through the water column. As is known the light intensity that helped boost the growth of seedlings of Rhizophora, both of root number Tanjong, elongation of shoots, number and leaf area23. Abiotic environmental conditions can explain their tolerance of each species for each particular more important in plant growth19. The roots susceptible to damage during the growth process due to extreme environmental factors24. This causes a growth pattern that varies from each individual. The number of branches of the rooting Rhizophora apiculata in flooded more than 6. Rhizophora apiculata growing on the environmental conditions are not stagnant, the comparison is evident in Fig. 3 (not waterlogged soil conditions) and Fig. 4 (waterlogged soil conditions). It showed a puddle role in the growth of branching in rooting. Related functions mangrove roots in the root system also acts as a system of aerial crop25, the amount of branching that occur in plants that are treated in the waterlogged environmental conditions it is possible to support the metabolism of plants. The roots of aerial where lentiselnya give flexibility to direct oxygen to get into the submerged part aerenchyma26. As is known, puddles will cause the limited availability of oxygen in the soil, causing hypoxic conditions20. Further dimensions of the root zone and the distribution of root density, root proliferation and elongation will be closely linked with water and photosynthesis of plants in soil density exposure27. Grzesiak28 in his study explains that the response of different species of mangrove against root damage due to sedimentasi related to the function of the root system, the tidal range, the composition and size of the sediment. Based on architectural of roots, the soil conditions are not inundated direction lateral root growth appears pointing downwards at an angle of 45 degrees (ortotrof). While on the ground waterlogging growth of roots more broad direction or sideways (plagiotrof). It is possible the structure of the soil, where the soil conditions of land was inundated by more pliant structure when compared with land that is not flooded. As described in the study of Zhu et al.29 that the growth response in any kind of roots and root system architecture is different between plants, where the density of the soil affects the root system is concentrated or dispersed. Besides, the environmental conditions of hypoxia induce the plant to develop a mechanism of adaptation to the direction of root growth diagravitropic to meet the availability of oxygen. Instead Rhizophora apiculata that grows on land not flooded conditions, the positive direction of the growth of roots ortho gravitropic. It is possible to environmental factors with the availability of sufficient oxygen so that the root elongation role is to support the plant and absorb water and nutrients in the soil. It is concluded that root length growth of Rhizophora apiculata differ significantly (α = 0.05) in the treatment of inundation and sediment thickness. Stress inundation and sediment thickness affects the morphology of the roots. The higher the sediment thickness, color is reddish brown root surface. Hair roots at the base of the stem, more huddled much on treating the condition of land were flooded. In architecture, puddle influence the direction of root growth. In waterlogged soil conditions, root growth leads down (perpendicular). While on land that is not waterlogged conditions, root growth more broad direction or sideways. This study discovers the possible effect of environmental conditions to mangrove plants morphology structures. Stress inundation and sediment thickness affects the morphology of the roots of mangrove. This study will help the researcher to uncover the critical conditions of mangrove habitat that have relation to special structure of mangrove roots. Thus, a new sight of knowledge on these stress factors from environment surrounding plants, may be arrived at some understanding of the specific system of mangrove plant to adapt in their extreme habitat. Thanks to Mr. Yuli (Department of Agriculture Surabaya) for providing the materials and facilities for data retrieval, Farid Kamal Muzaki, S.Si., M.Sc. (ITS), for technical advice on the use of their facilities for the collection, Athiq Kaezar to help in the statistical analysis and the member of the Laboratory of Ecology, Airlangga University for helpful assistances. Ahmed, E.A. and K.A.Abdel-Hamid, 2007. Zonation pattern of Avicennia marina and Rhizophora mucronata along the Red sea coast, Egypt. World Applied Sci. J., 2: 283-288. Bertolde, F.Z., A.A.F. De Almeida, R.X. Correa, F.P. Gomes, F.A. Gaiotto, C.V. Baligar and L.L. Loguercio, 2010. Molecular, physiological and morphological analysis of waterlogging tolerance in clonal genotypes of Theobroma cacao L. Tree Physiol., 30: 56-67. Crowe, A. and J. Hay, 2004. Effect of fine sediment on river biota: Report No. 951. Cawthron Institute, 98 Halifax Street East, Nelson, New Zealand, pp: 35. De Souza, T.C., E.M. de Castro, F.J. Pereira, S.N. Parentoni and P.C. Magalhaes, 2009. Morpho-anatomical characterization of root in recurrent selection cycles for flood tolerance of maize (Zea mays L.). Plant Soil Environ., 55: 504-510. Drexler, J.Z., 2001. Maximum longevities of Rhizophora apiculata and R. mucronata propagules. Pac. Sci., 55: 17-22. Fitter, A.H. and R.K.M. Hay, 1991. Fisiologi Lingkungan Tanaman. Gajah Mada University Press, Yogyakarta, Indonesian, Pahes: 421. Furukawa, K. and E. Wolanski, 1996. Sedimentation in mangrove forests. Mangroves Salt Marshes, 1: 3-10. Ghobadi, M.E. and M. Ghobadi, 2010. Effect of anoxia on root growth and grain yield of wheat cultivars. World Acad. Sci. Eng. Technol., 4: 729-732. Grzesiak, M.T., 2009. Impact of soil compaction on root architecture, leaf water status, gas exchange and growth of maize and triticale seedlings. Plant Root, 3: 10-16. Guarino, A.J., L.S. Meyers and G. Gamst, 2009. Analysis of Variance Designs. Cambridge University Press, Cambridge, Pages: 208. Hirano, Y. and N. Hijii, 1998. Effects of low pH and aluminum on root morphology of Japanese red cedar saplings. Environ. Pollut., 101: 339-347. Kathiresan, K. and N. Rajendran, 2002. Growth of a mangrove (Rhizophora apiculata) seedlings as influenced by GA3, light and salinity. Rev. Biol. Trop., 50: 525-530. Kathiresan, K., 2003. How do mangrove forests induce sedimentation? Rev. Biol. Trop., 51: 355-360. Marchand, C., E. Lallier-Verges and M. Allenbach, 2011. Redox conditions and heavy metals distribution in mangrove forests receiving effluents from shrimp farms (Teremba Bay, New Caledonia). J. Soils Sediments, 11: 529-541. Naidoo, G., Y. Naidoo and P. Achar, 2010. Responses of the mangroves Avicennia marina and Bruguiera gymnorrhiza to oil contamination. Flora-Morphol. Distribut. Funct. Ecol. Plants, 205: 357-362. Noor, Y.R., M. Khazali and I.N.N. Suryadiputra, 1999. Panduan Pengenalan Mangrove di Indonesia. Ditjen PHKA., Bogor, Indonesia, pp: 102. Parent, C., N. Capelli, A. Berger, M. Crevecouer and J.F. Dat, 2008. An overview of plant responses to soil waterlogging. Plant Stress, 2: 20-27. Piniak, G.A., 2007. Effects of two sediment types on the fluorescence yield of two Hawaiian scleractinian corals. Mar. Environ. Res., 64: 456-468. Promkhambut, A., A. Younger, A. Polthanee and C. Akkasaeng, 2010. Morphological and physiological responses of sorghum (Sorghum bicolor L. moench) to waterlogging. Asian J. Plant Sci., 9: 183-193. Purnobasuki, H. and M. Suzuki, 2004. Root system architecture and gravity perception of a mangrove plant, Sonneratia alba J. Smith. J. Plant Biol., 47: 236-243. Purnobasuki, H. and M. Suzuki, 2005. Functional anatomy of air conducting network on the pneumatophores of a mangrove plant, Avicennia marina (Forsk.) vierh. Asian J. Plant Sci., 4: 334-347. Setter, T.L. and I. Waters, 2003. Review of prospects for germplasm improvement for waterlogging tolerance in wheat, barley and oats. Plant Soil, 253: 1-34. Suhendra, D., 2006. Pengaruh sedimen terhadap komunitas Karang Batu (Scleractinian corals) di Kepulauan Derawan Kalimantan Timur. Master's Thesis, Magister Sain Program Studi Ilmu Kelautan, Pasca Sarjana Institut Pertanian Bogor, Bogor. Thampanya, U., J.E. Vermaat and J. Terrados, 2002. The effect of increasing sediment accretion on the seedlings of three common Thai mangrove species. Aquat. Bot., 74: 315-325. Thaxton, J.M., S.J. DeWalt and W.J. Platt, 2007. Spatial patterns of regeneration after Hurricane Andrew in two South Florida fringe mangrove forests. Florida Sci., 70: 148-156. Wolanski, E., 1994. Physical Oceanography Processes of the Great Barrier Reef. CRC Press, Boca Raton, Florida, Pages: 194. Yong, Y.E. and N.F.Y. Tam, 2007. Effects of used lubricating oil on two mangroves Aegiceras corniculatum and Avicennia marina. J. Environ. Sci., 19: 1355-1360. Zhu, T., S. Fang, Z. Li, Y. Liu, H. Liao and X. Yan, 2006. Quantitative analysis of 3-dimensional root architecture based on image reconstruction and its application to research on phosphorus uptake in soybean. Chinese Sci. Bull., 51: 2351-2361.